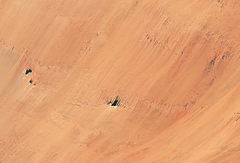 The following ? 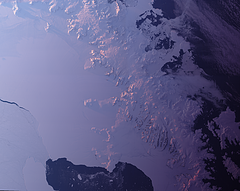 have been newly added to the catalog recently. 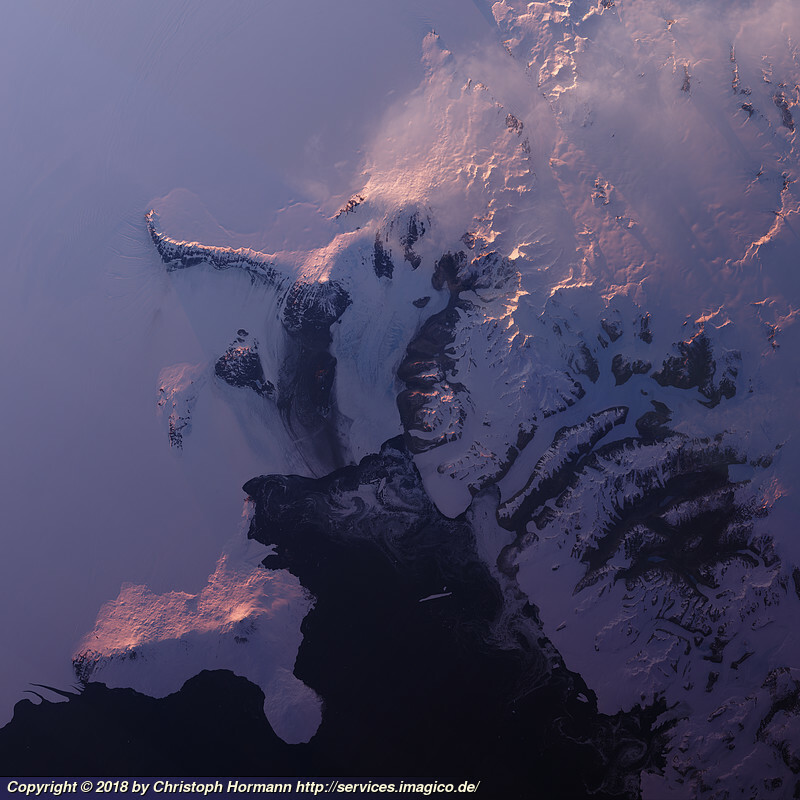 Nighttime Landsat mosaic of McMurdo Sound with Ross island on the lower left and the McMurdo Dry Valleys on the right. 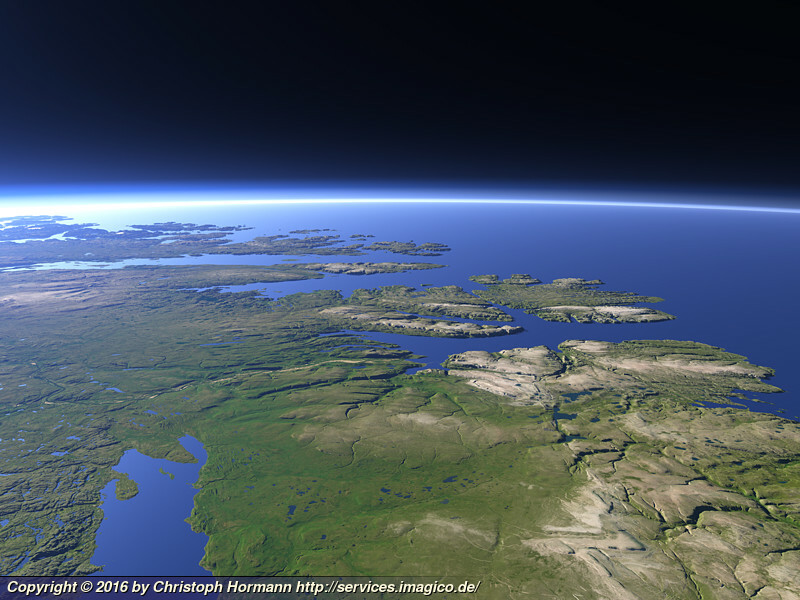 Sun is very low in the south. Nighttime Landsat mosaic of the Lambert Glacier and Amery Ice Shelf in eastern Antarctica in early 2019. 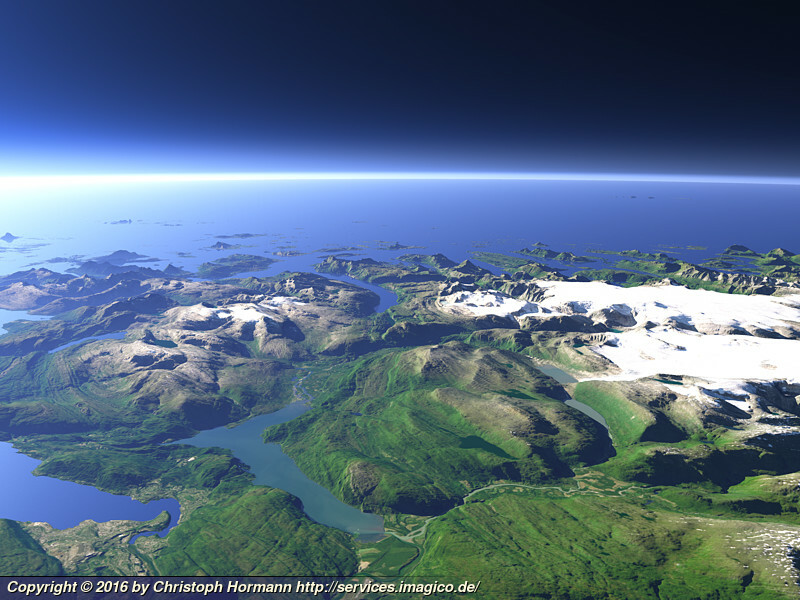 Sun is coming from the south which is on the left. 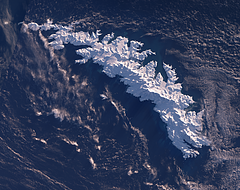 Nighttime Landsat mosaic of the Antarctic Peninsula with North on the lower right. 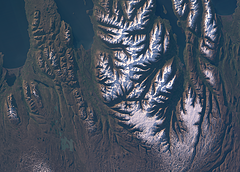 Winter Landsat image from just after sunrise in early 2019 of the Westfjords in northwestern Iceland with relatively little snow. 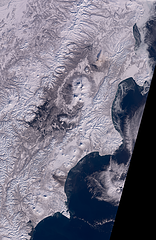 Landsat mosaic of the Kamchatka peninsula in February 2019 with activity of three different volcanoes simultaneously. 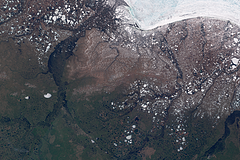 Landsat mosaic of Northern Greenland and Northern Ellesmere Island in late August/early September 2018. This includes the nearly cloud free September 2018 off nadir pass and matching scenes from further south. 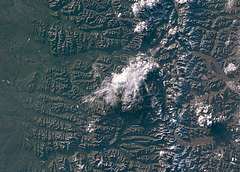 Landsat 8 evening image of the northern Ural moundains in Russia at the border between Europe and Asia. 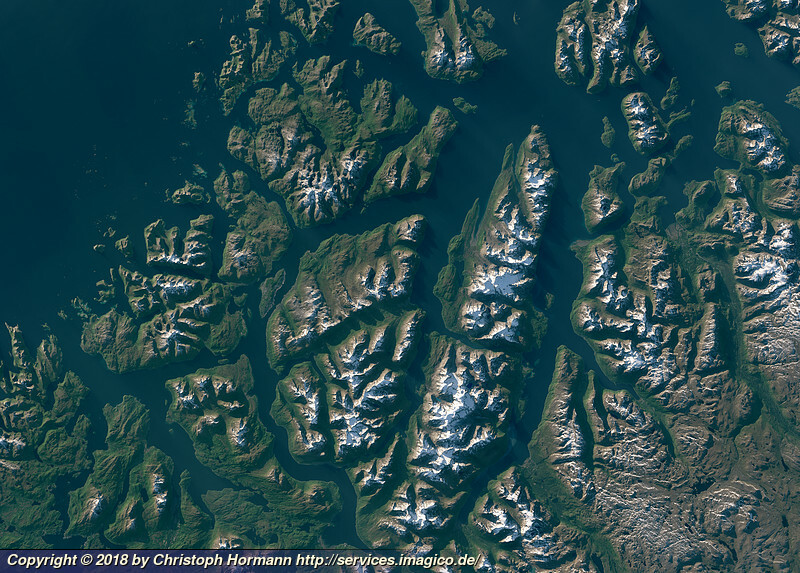 Landsat 8 evening image of the coast of northern Norway around Tromsø. 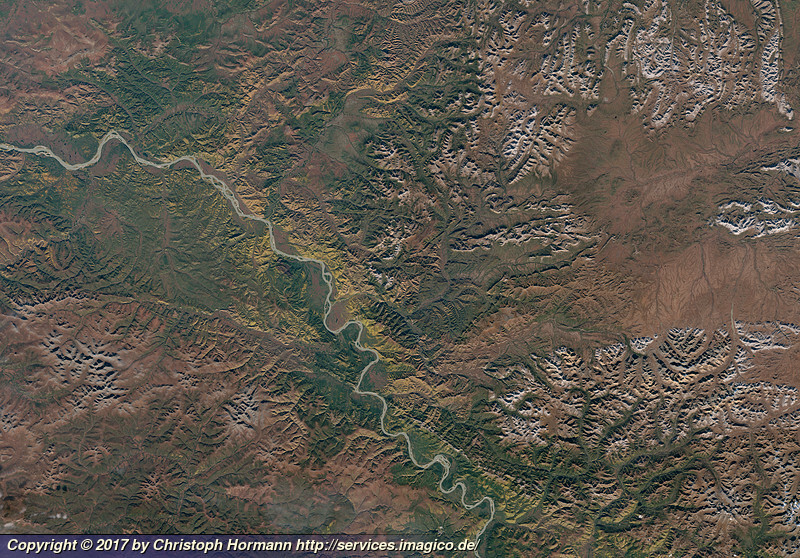 Landsat 8 evening image of the Verkhoyansk Mountains in northeastern Russia east of the Lena river. 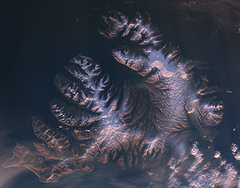 Landsat 8 evening image of northern Iceland with Tröllaskagi and the town of Akureyri. Sentinel-2 mosaic of the thawing Tundra in June 2018 in northeastern Russia (Sakha Republic) at the Arctic Ocean coast. 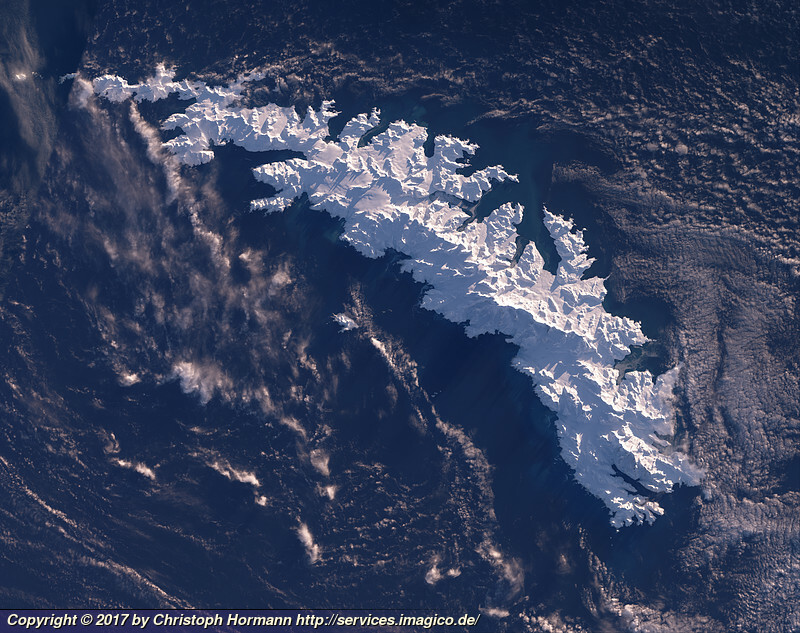 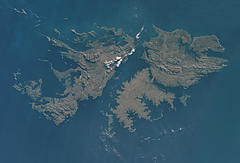 Sentinel-2 mosaic of the Falkland islands in early Winter 2018 with low sun position but without snow. 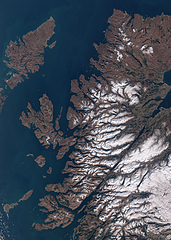 Sentinel-2 image of the northwestern part of Scotland in Winter (early 2018) with snow in the higher mountain areas. 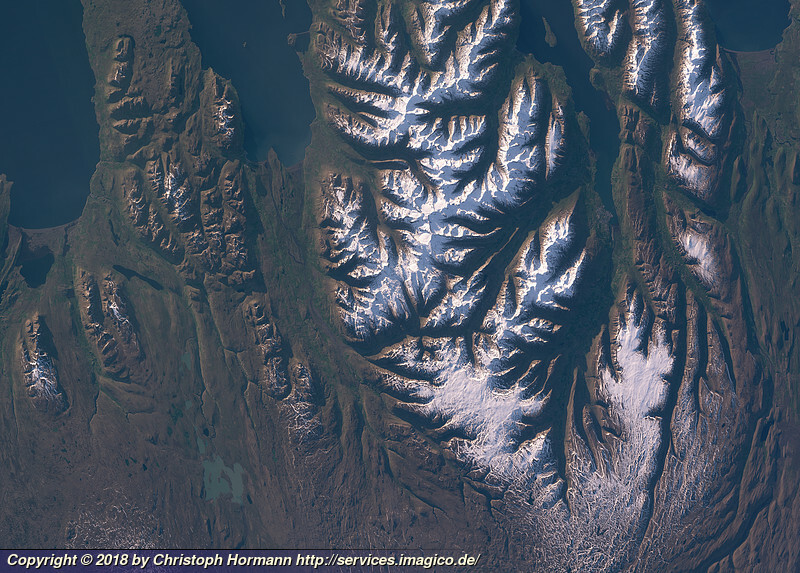 Landsat mosaic of the island of Crete in winter with snow in the mountains. 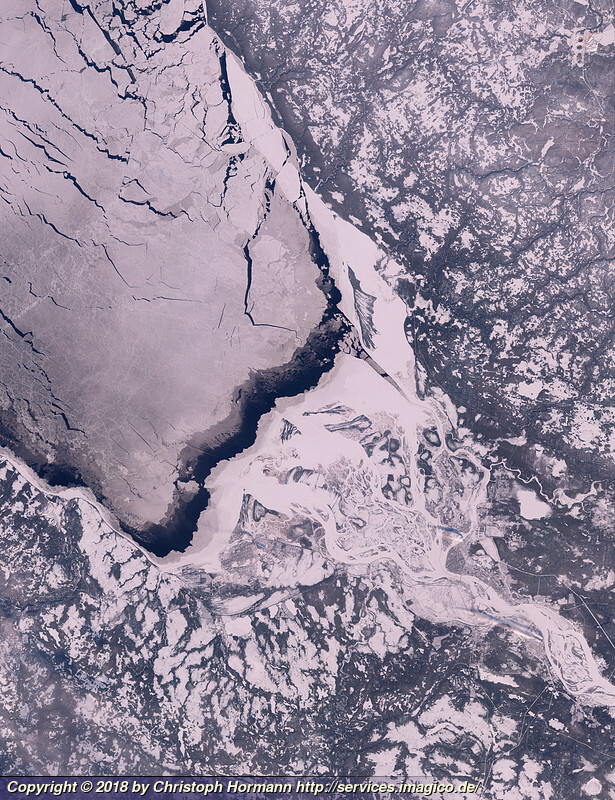 Assembled from Landsat imagery from 2016-2018. Southwards view of the South Island of New Zealand onto the eastern slope of the Southern Alps with the Waimakariri and Rakaia River in the foreground and Lake Tekapo and Lake Pukaki in the background. 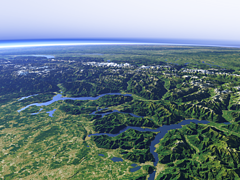 Uses data copyright OpenStreetMap contributors and elevation data from LINZ (CC BY 3.0 NZ). 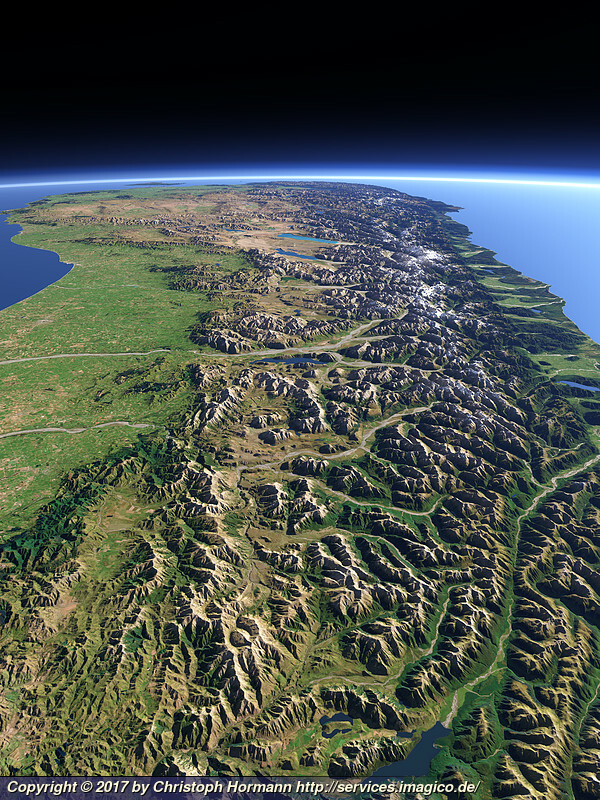 View of the region of Fiordland in the southwest of New Zealand, a rugged and largely inaccessible region with a very wet climate and a unique ecosystem. 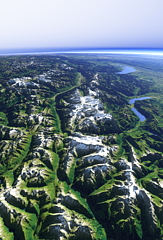 Uses data copyright OpenStreetMap contributors and elevation data from LINZ (CC BY 3.0 NZ). 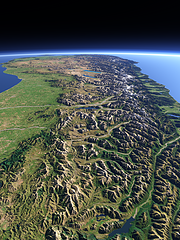 View of the southwestern part of New Zealand with the southern end of the Southern Alps in the foreground and the fjords and lakes of the Fjordland region in the background. 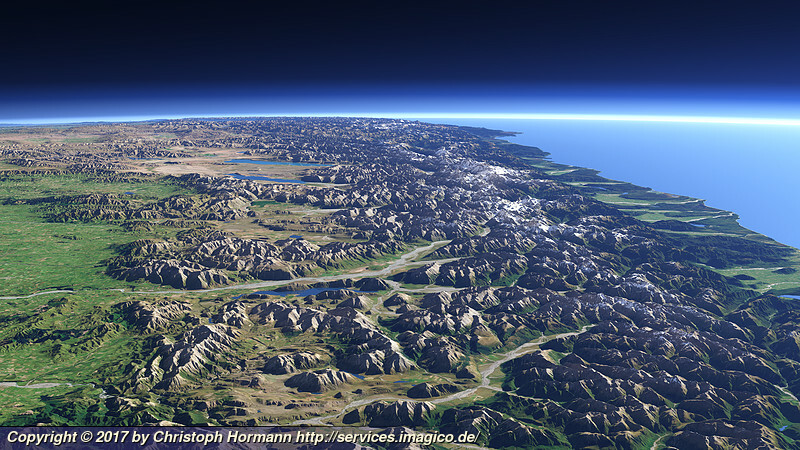 Uses data copyright OpenStreetMap contributors and elevation data from LINZ (CC BY 3.0 NZ). 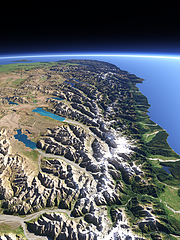 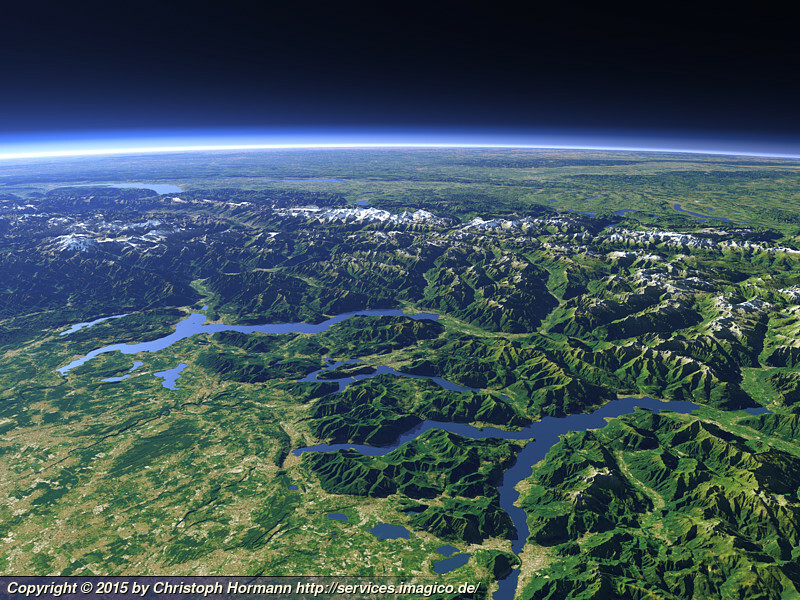 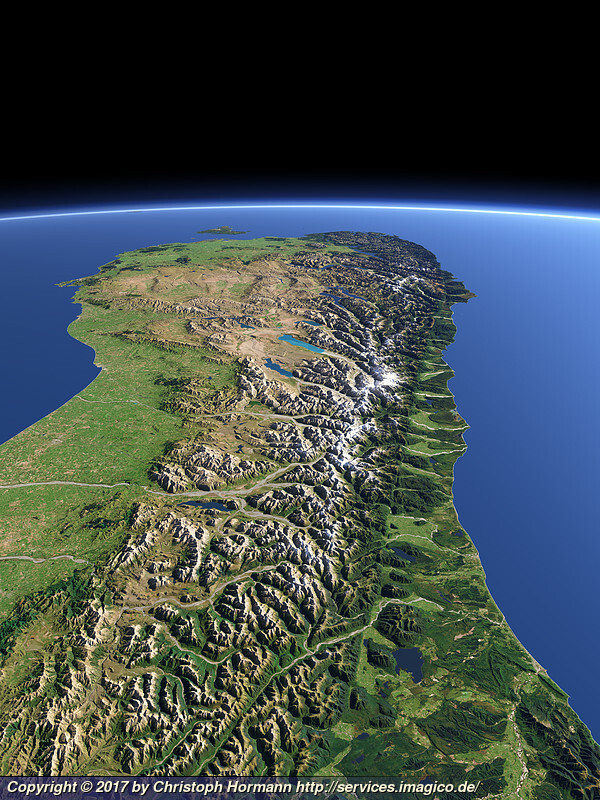 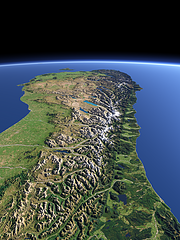 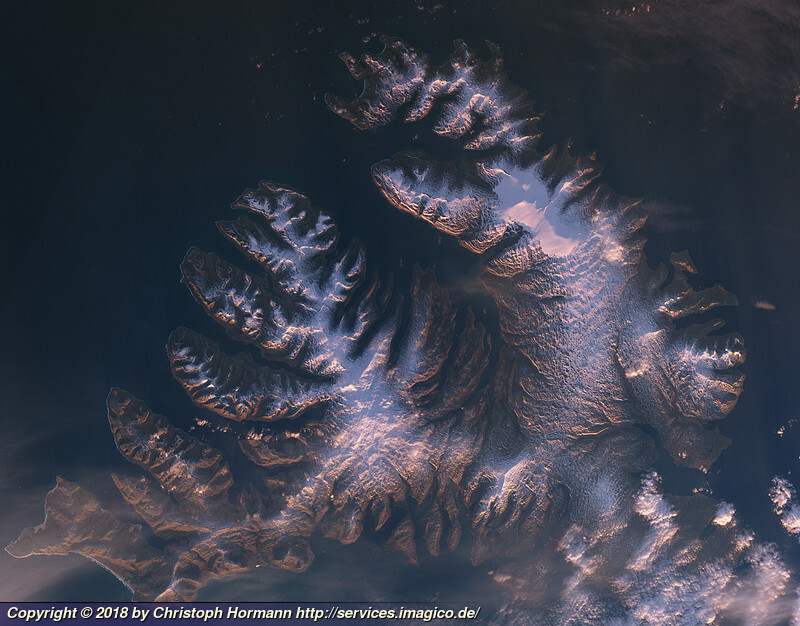 View of the Southern Alps on the south Island of New Zealand from the north with its glaciated peaks and the lakes and the braided rivers on the eastern side. 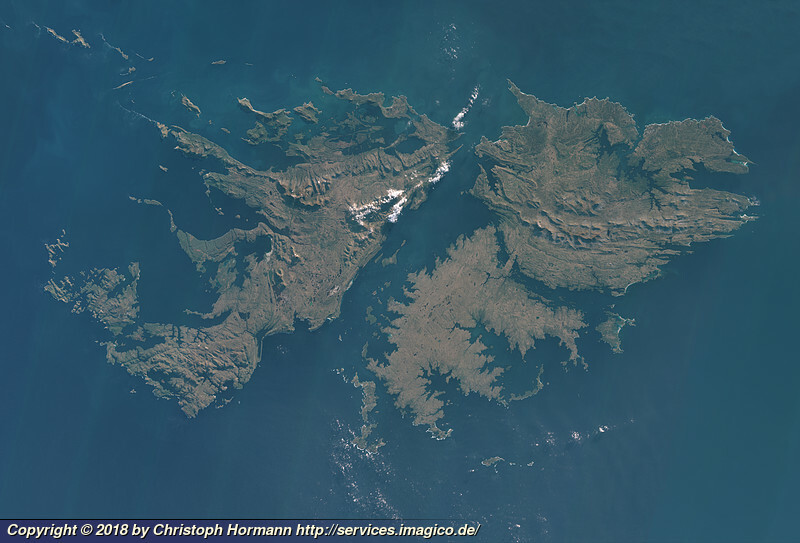 Uses data copyright OpenStreetMap contributors and elevation data from LINZ (CC BY 3.0 NZ). 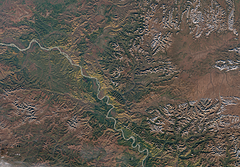 Sentinel-2 image of the Yukon River at the border of Alaska and Yukon(Canada), in Autumn 2017. 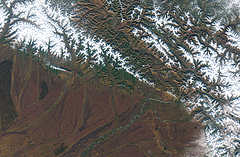 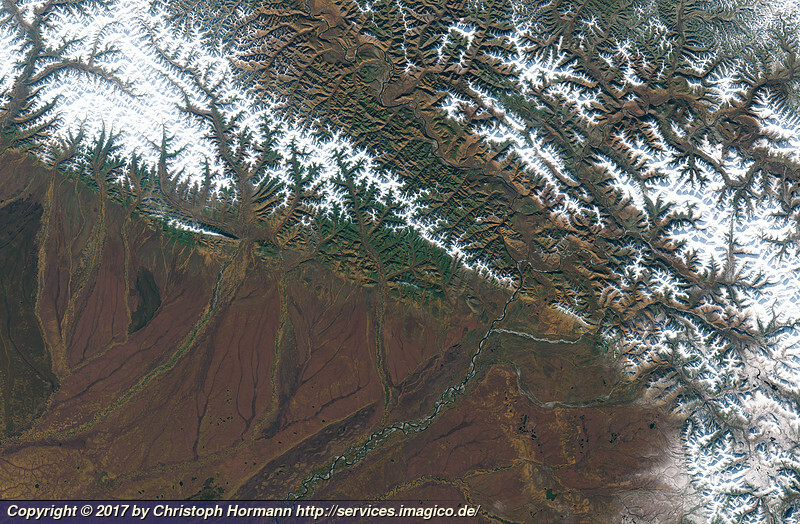 Sentinel-2 image of the southern slopes of the Verkhoyansk Range around the Tompo River northeast of Yakutsk in Autumn 2017 with fresh snow in the mountains. 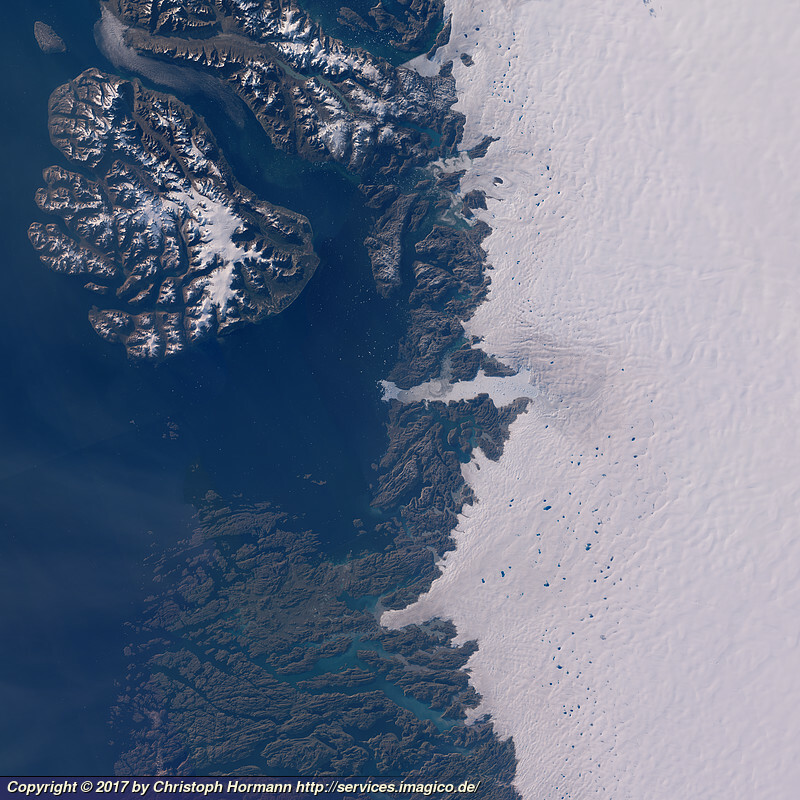 Landsat mosaic of Northeastern Greenland based on evening images from July/August 2017. Landsat mosaic of Western Greenland near Ilulissat with Jakobshavn Glacier and Disko Bay based on evening images. 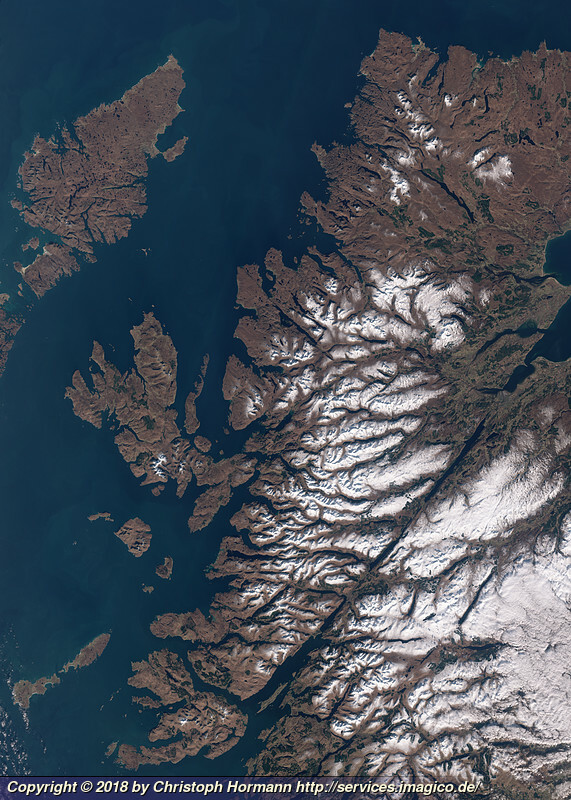 Landsat mosaic of South Georgia in Winter 2017 with exceptionally good weather and nearly no clouds over the island. Landsat mosaic of the Alaska Peninsula from Mount Aniakchak to Unimak Island in early January 2017 with low sun position and snow covered mountains. 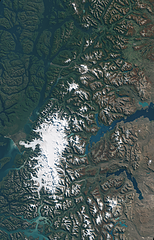 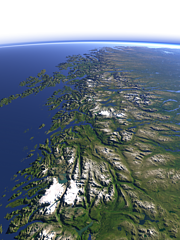 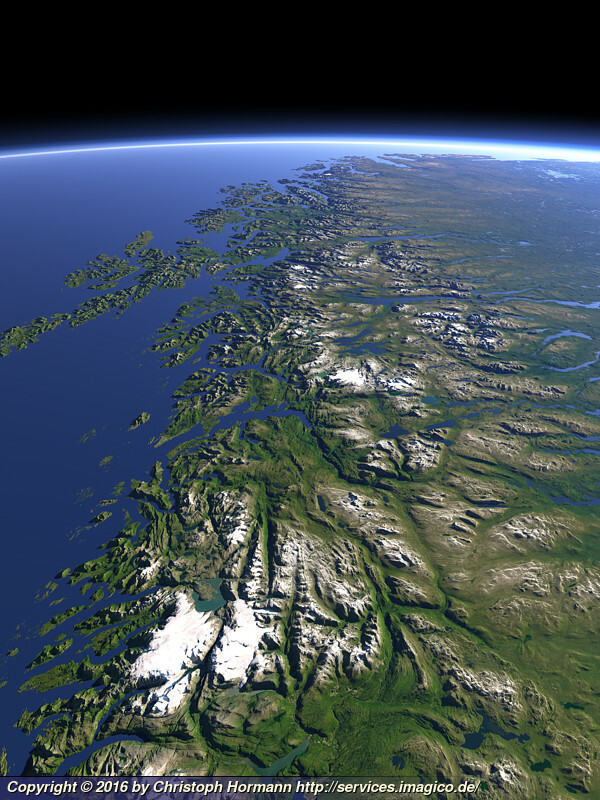 Sentinel-2 image of the Andes Mountains in Patagonia and the Northern Patagonian Ice Field in Autumn with deciduous Nothofagus forests in strong red colors. The San Fancisco Bay area in April 2016. 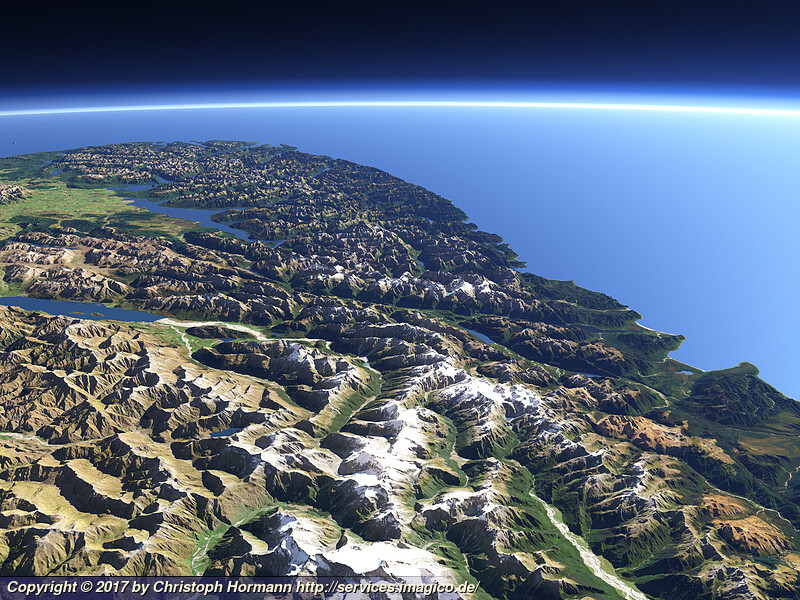 Image is based on Copernicus Sentinel data from 2016, attribution required. 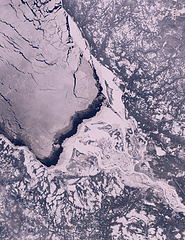 Landsat mosaic of Severnaya Zemlya from late March/early April 2016 with the islands nearly fully snow covered, land fast sea ice between and around the islands and pack ice around on the Kara Sea and the Laptev Sea. 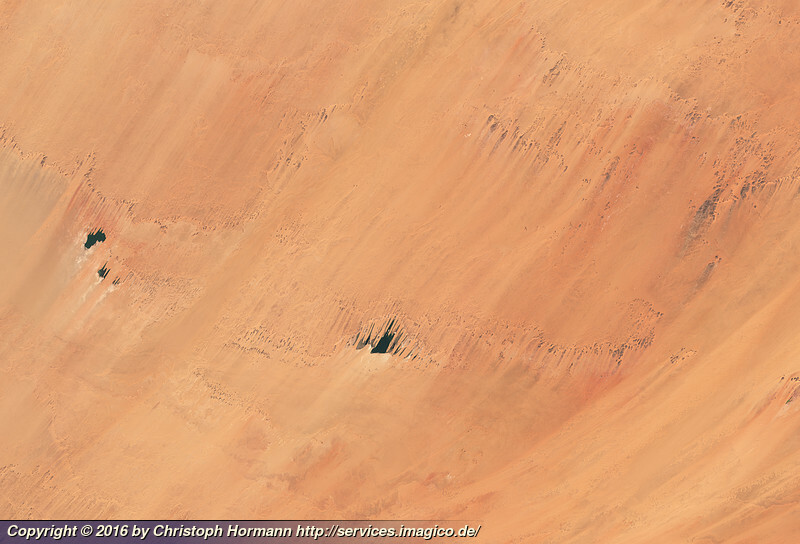 The Lakes of Ounianga are a number of groundwater fed lakes in the eastern Sahara desert in northeastern Chad that form a remarkable landscape feature in the otherwise dry desert. 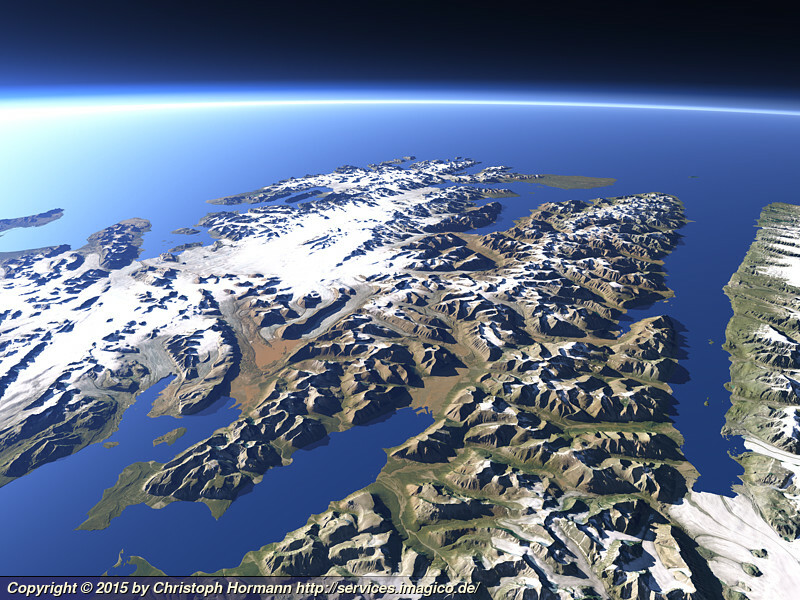 Image is based on Copernicus Sentinel data from 2016, attribution required. 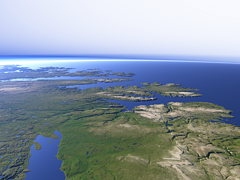 View of the northern part of the coast of Norway with the counties of Nordland and Troms and the town of Bodø near the center. 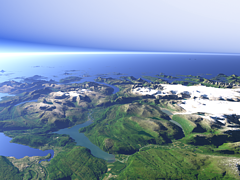 In the foreground you can see the bright ice of the Svartisen glacier and on the left behind the Vestfjorden separates the Lofoten from the mainland. 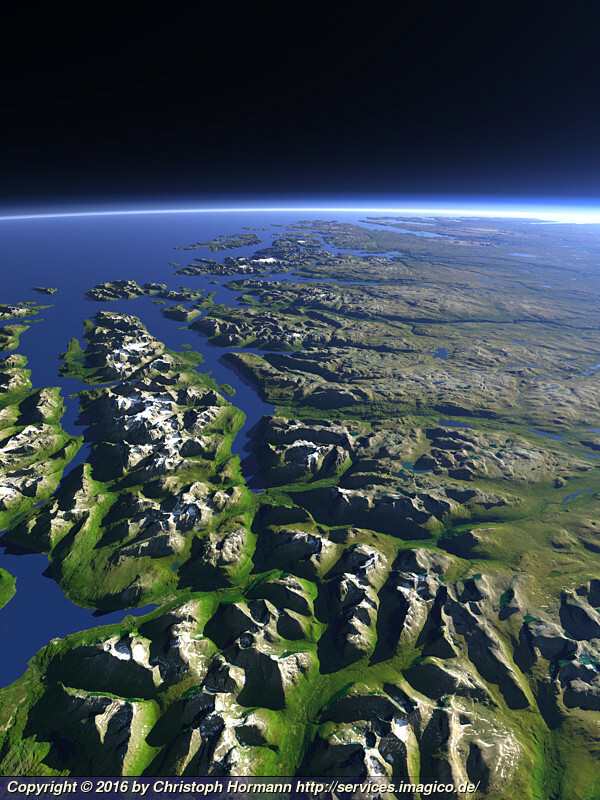 Norway only forms a narrow area near the coast and the coastal mountains here, most of the lakes on the right side are already in Sweden. 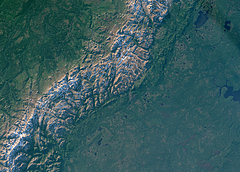 Uses data copyright OpenStreetMap contributors and elevation data from Kartverket (CC-By 4.0). 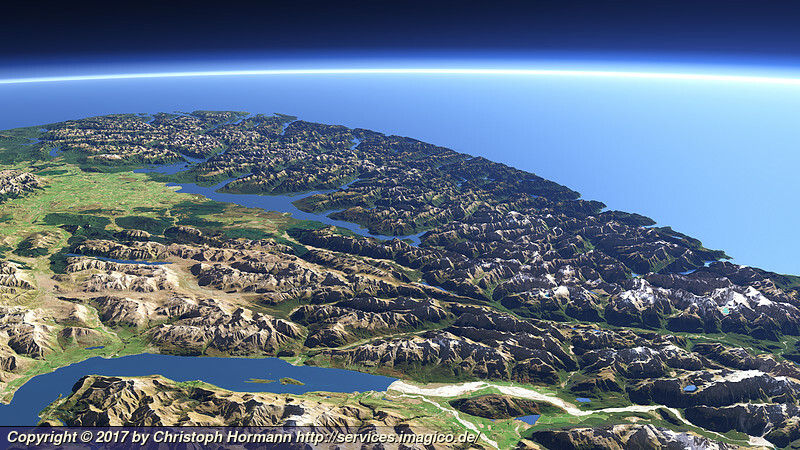 Closeup view of the Norwegian coast south of the Svartisen with the town of Mo i Rana on the foreground left. 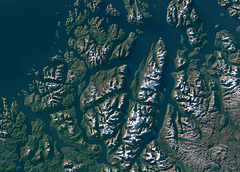 Uses data copyright OpenStreetMap contributors and elevation data from Kartverket (CC-By 4.0). View of the northern Norway coast south of the town of Hammerfest with the Altafjord on the foreground left and the islands Sørøya, Seiland and Stjernøya. 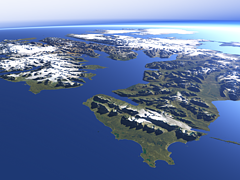 Uses data copyright OpenStreetMap contributors and elevation data from Kartverket (CC-By 4.0). 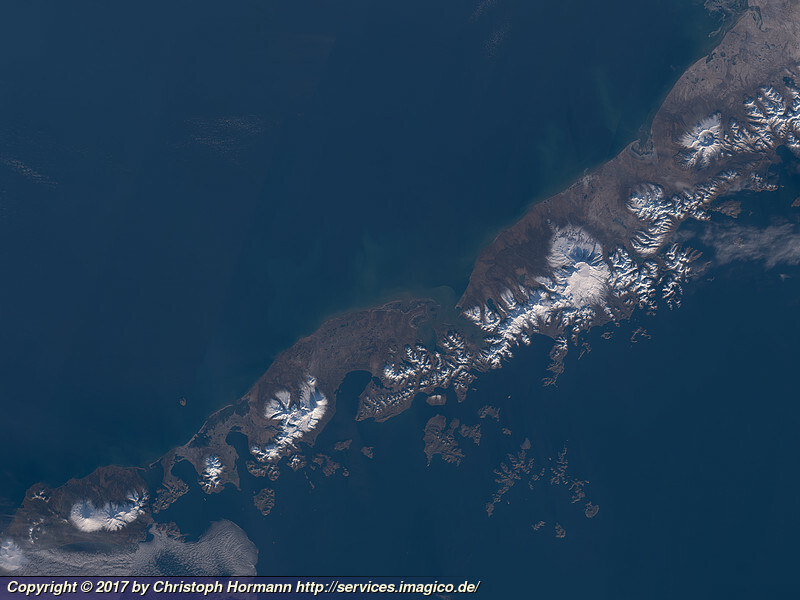 View of the rugged coast of northern Norway east of the Town of Tromsø with the Lyngen Alps and the Lyngen fjord on the center left. Uses data copyright OpenStreetMap contributors and elevation data from Kartverket (CC-By 4.0). 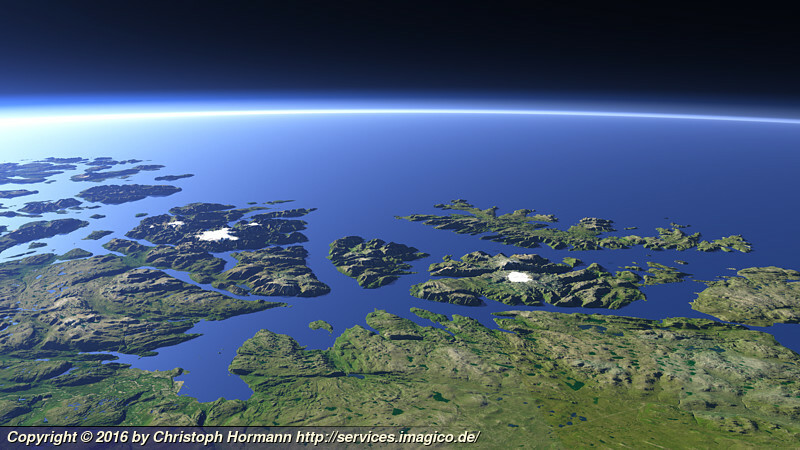 View of the northmost part of mainland Norway around the North Cape from east with the Varangerfjord in the foreground. 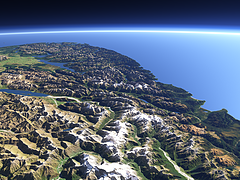 Uses data copyright OpenStreetMap contributors and elevation data from Kartverket (CC-By 4.0). View of the Isfjorden, the largest bay on the western side of Svalbard where most of the current and former settlements on the island including Longyearbyen and Barentsburg are located. 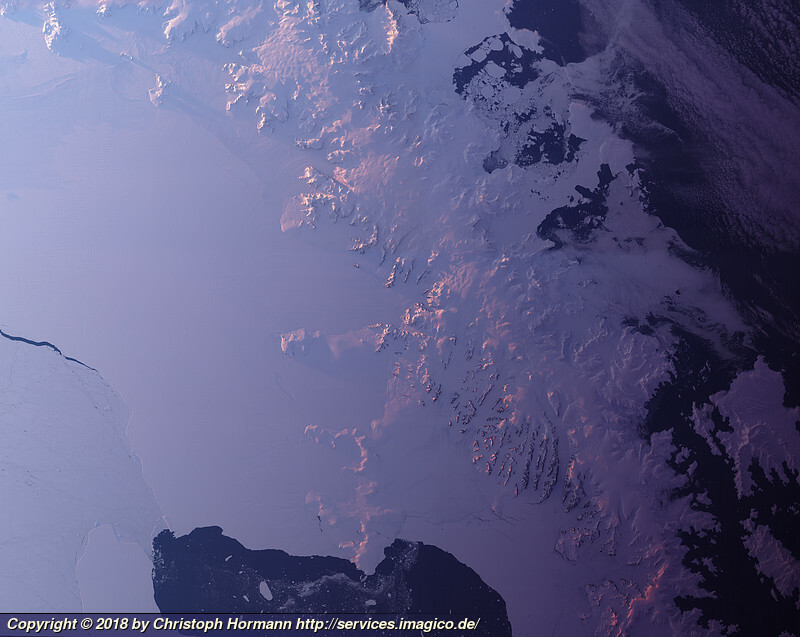 Uses data from the Norwegian Polar Institute (CC-By 4.0). 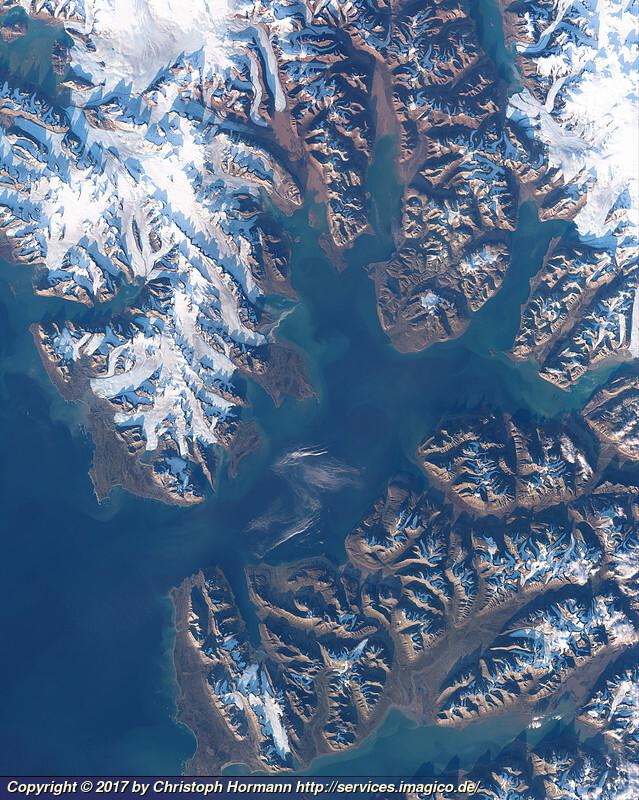 View of the northwest part of the island of Spitzbergen, Svalbard which forms a peninsula separated from the rest of the island by the Isfjorden on the bottom left and the Wijdefjorden on the right. 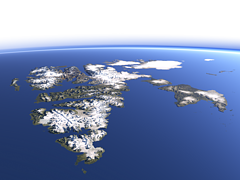 This part of the island is particularly notable for the red sandstone mountains that contrast here with the white of the glaciers and the green coasts of the fjords. 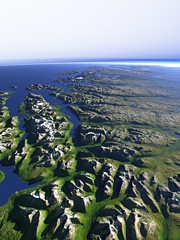 Uses data from the Norwegian Polar Institute (CC-By 4.0). View of the Archipelago of Svalbard from south with the main island Spitzbergen on the left and Edgeøya, Barentsøya, Nordaustlandet and Kvitøya on the right. Uses data from the Norwegian Polar Institute (CC-By 4.0). 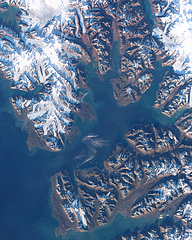 View of the eastern coast of the island Spitzbergen in Svalbard with the Storfjorden on the bottom right and the strongly glaciated Olav-V-Land and the Hinlopenstretet behind separating Spitzbergen from Nordaustlandet on the far right. 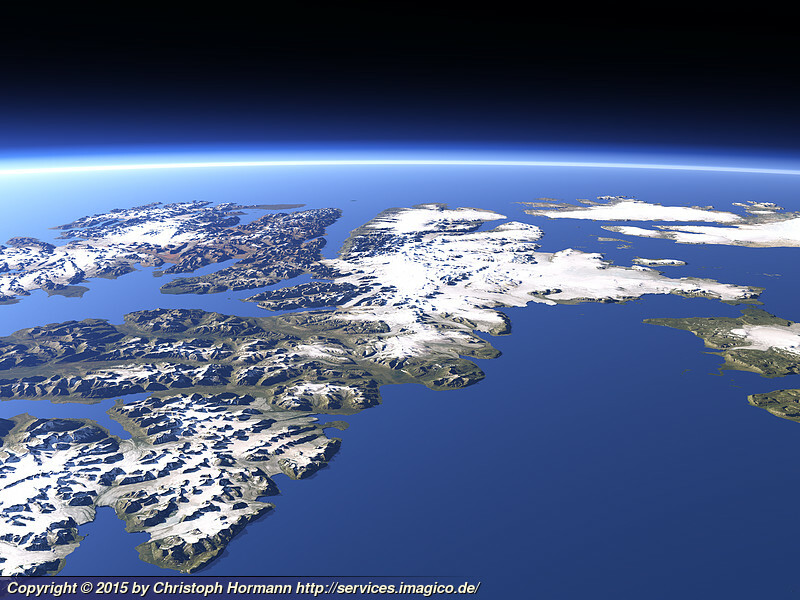 Uses data from the Norwegian Polar Institute (CC-By 4.0). 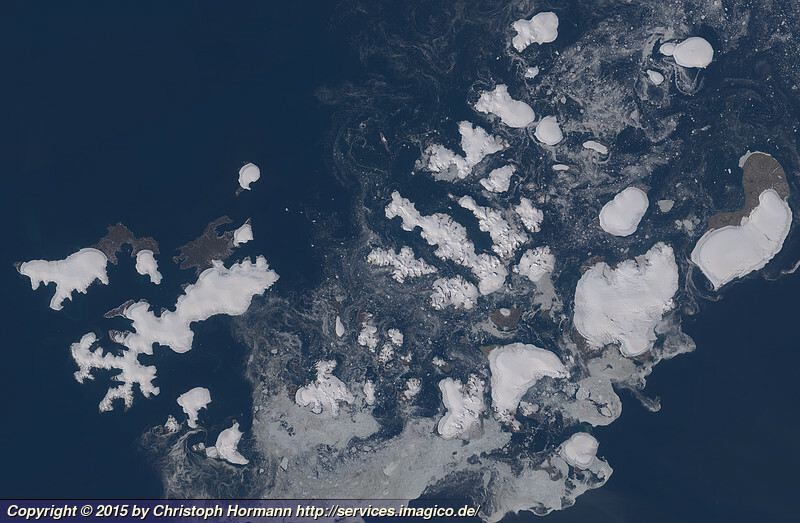 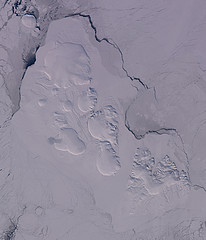 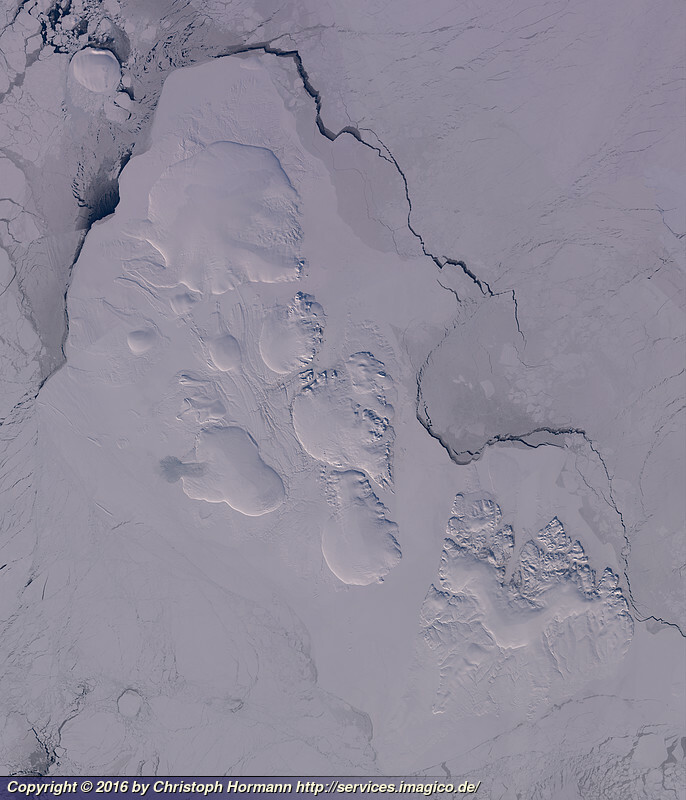 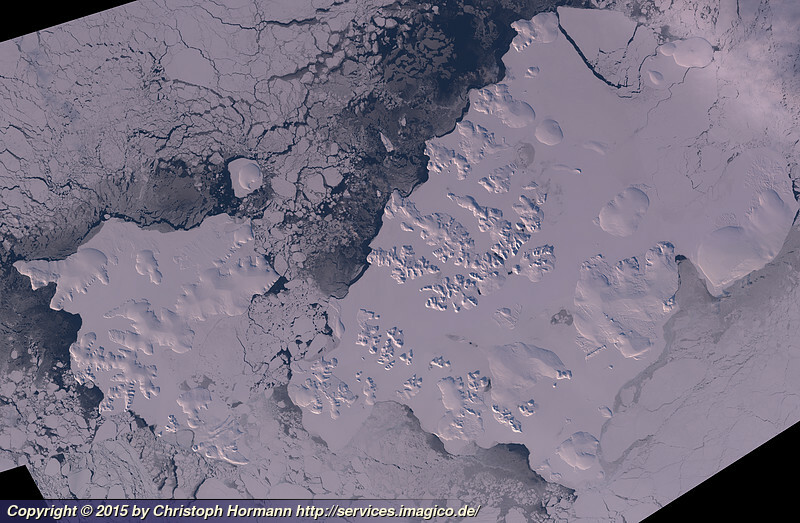 Landsat mosaic of Franz Josef Land vom Ende Juli 2015, some weeks before the snow minimum with remains of drift ice between the islands in the otherwise largely ice free polar ocean. Landsat mosaic of Franz Josef Land from late March/early April 2015 with the islands nearly fully snow covered, land fast sea ice between the islands and pack ice around on the ocean. View of the southern edge of the Western Alps with Lago di Como and Lago Maggiore and between the smaller Lago di Lugano. 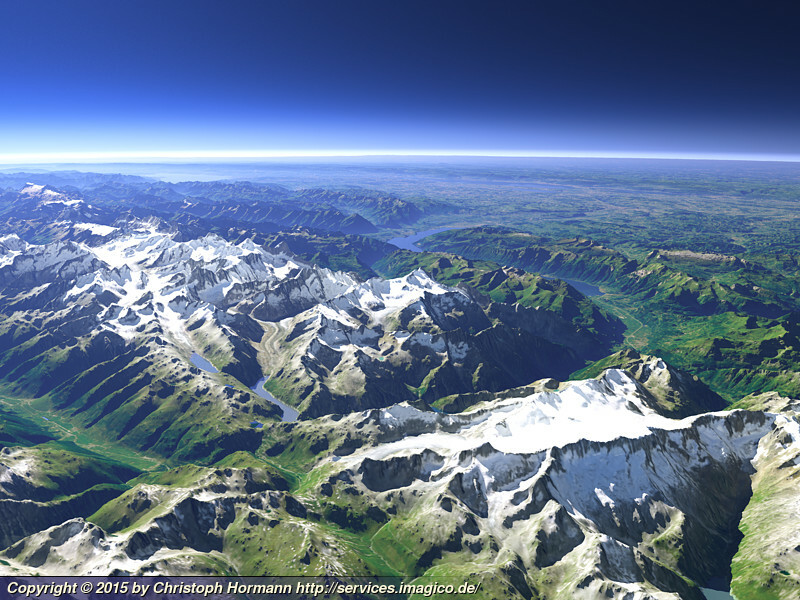 Behind the Alps. 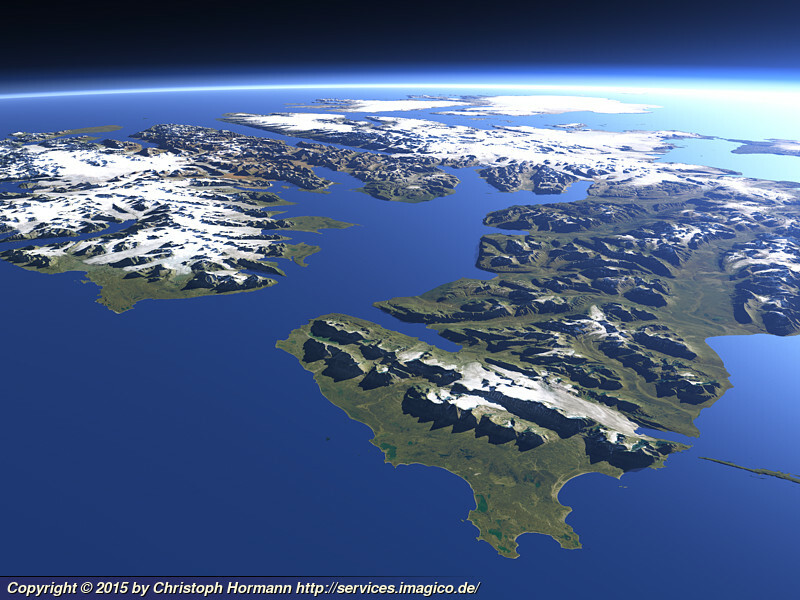 Uses data copyright OpenStreetMap contributors. 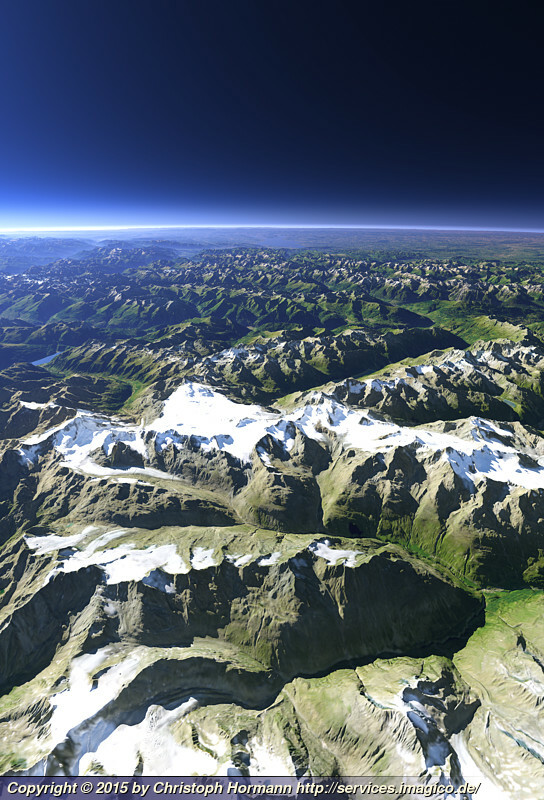 View of the Alps from the west with France in the foreground and the western bow of the mountains behind, in the background right the plains of the river Po. 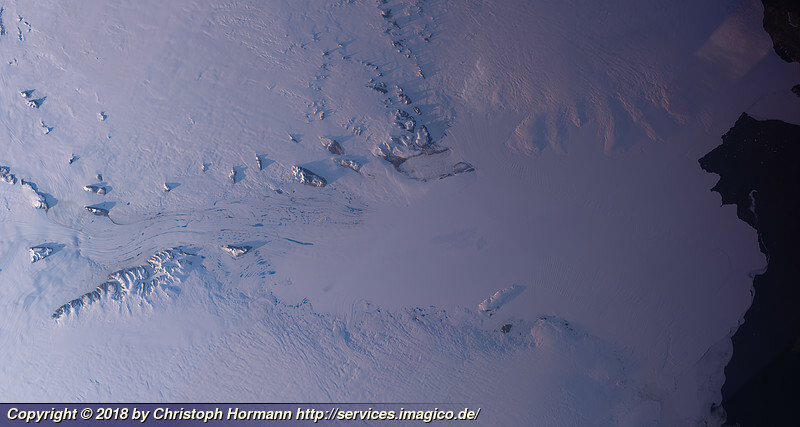 Uses data copyright OpenStreetMap contributors. 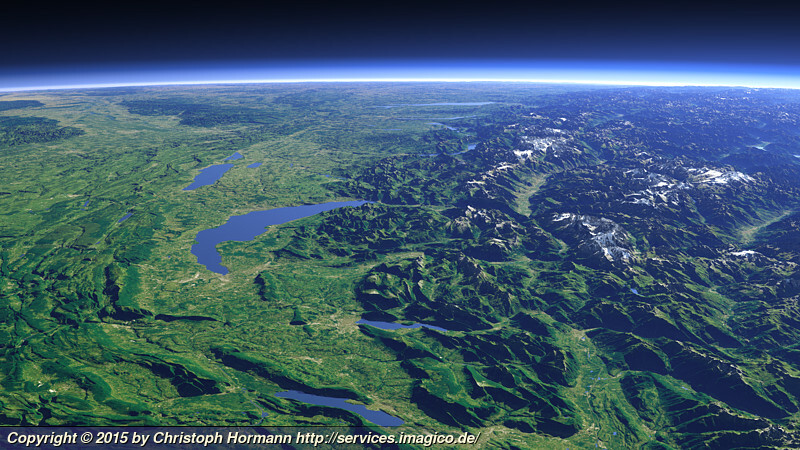 View of the northwestern part of the Alps with the Upper Rhone valley in the center between the Bernese and Uri Alps on the right and the Pennine Alps on the background left. 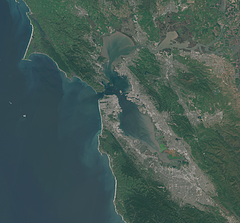 Uses data copyright OpenStreetMap contributors. 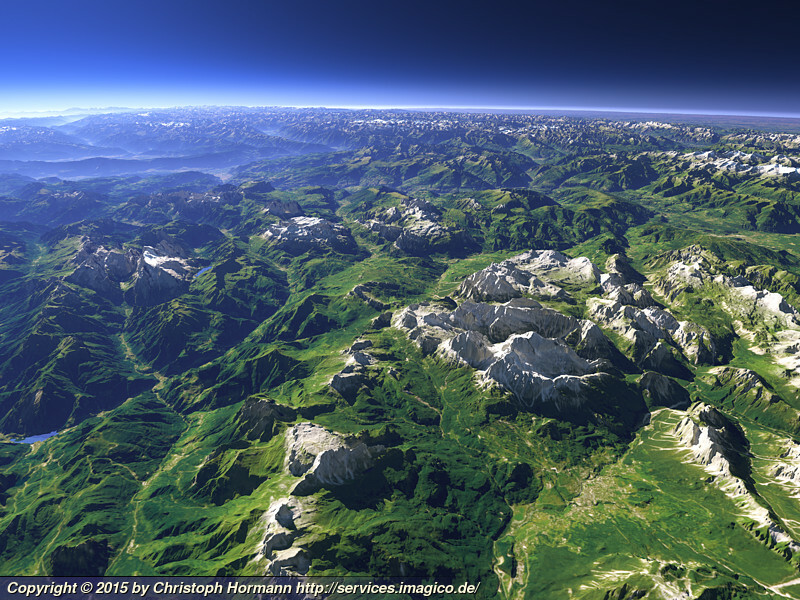 View of the Dolomites near Cortina d’Ampezzo towards the northwest. 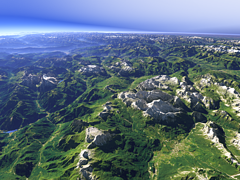 Uses data copyright OpenStreetMap contributors and elevation data from Land Kärnten - data.ktn.gv.at (CC BY 3.0 AT) and from Autonome Provinz Bozen - Südtirol (CC BY 3.0) and Regione del Veneto (IODL 2.0). 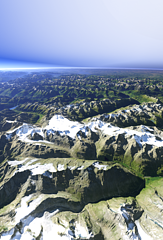 View of the Ötztal Alps at the border between Italy and Austria from southeast with the Fineilspitze in the foreground left, the Weißkugel on the center left and the heavily glaciated parts around the Gepatschferner in the center. 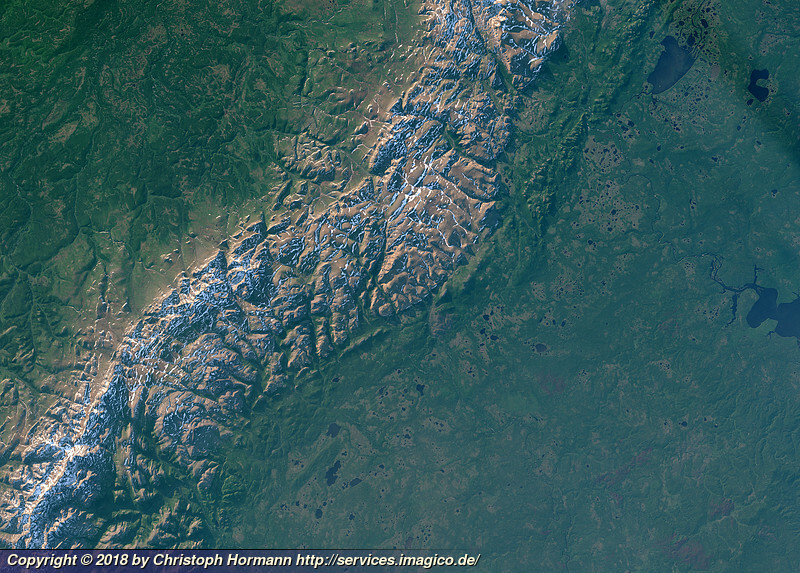 Uses data copyright OpenStreetMap contributors and elevation data from Land Kärnten - data.ktn.gv.at (CC BY 3.0 AT) and from Autonome Provinz Bozen - Südtirol (CC BY 3.0). 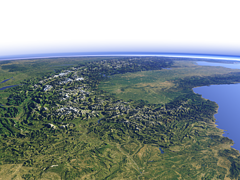 View of Switzerland from the southwest with Lake Geneva in the center left, the Alps on the right, the Jura mountains on the left and the upper Rhine valley in the background. 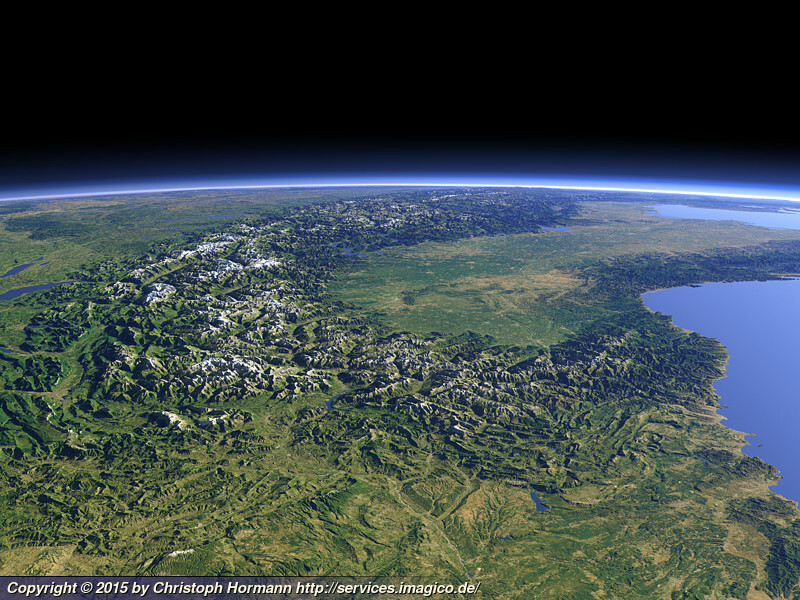 Uses data copyright OpenStreetMap contributors. 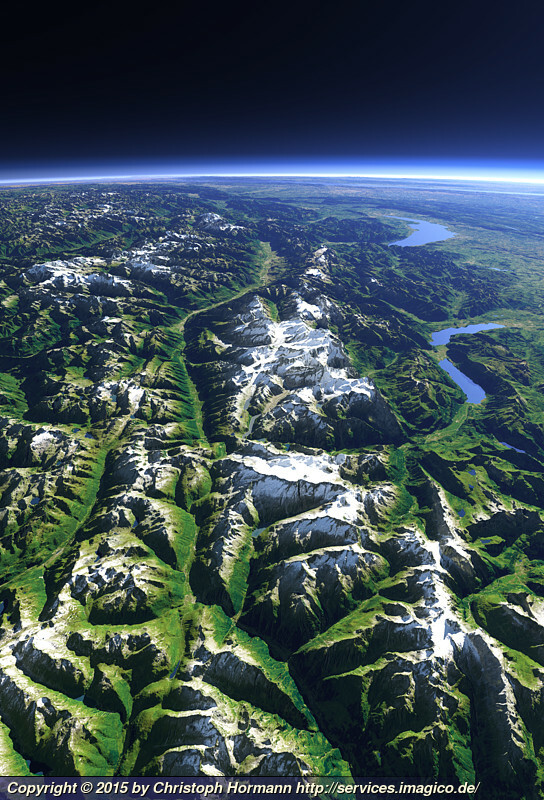 View of the Bernese and Uri Alps from the Southeast with the Dammastock and Rhône Glacier on the right, the Furka Pass and Grimsel Pass in the center and the Bernese Alps and the upper Rhône valley on the left. Uses data copyright OpenStreetMap contributors.